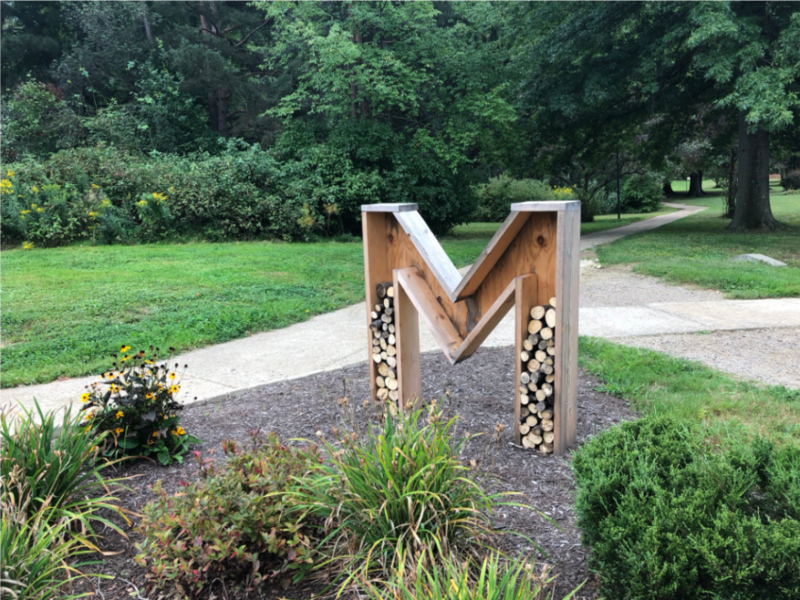 The bee hotel is located within the Sister Maura Smith Peace Garden, on the hill behind Warde Hall, with the purpose of providing refuge and shelter to insects native to the Erie area, whose numbers have declined in recent years. The bee hotel takes the form of an upright letter “M”, filled with drilled logs to provide homes for solitary bees. Unlike honey bees, solitary bees do not live in hives and prefer to burrow into wood. They are also less aggressive or likely to sting. Sarah Bennett, Ph.D., Senior Lecturer of Biology and Sustainability Officer for the university, has been integral in overseeing this addition. “Pollinators all over the world are declining, so if we can provide a habitat for them, then that might help their numbers locally,” Bennett said. The bee hotel is the result of a student project led by 2018 graduate Catherine Erway, who majored in Sustainability and Biology. She came up with the idea of a bee hotel for a Restoration Ecology course that she took during her time at Mercyhurst. Erway spent a portion of the course researching what the structure would need to look like and how it would need to be set up in order to attract the pollinators, and to keep them safe in a way that could protect bee populations sustainably. Her ideas and design have since been used to make this idea a reality. Her project was in response to the global issue of declining bee populations, which extends far beyond the gates and has widely negative impacts for agriculture and society. Bennett, as Sustainability Officer, oversees all new sustainable undertakings. She helped to secure the necessary finances for this project, receiving the money from a Sustainability Fund, into which each student has paid $5 per semester since 2006. Emma Mader is a junior Environmental Science major who is involved with the Sustainability Fund through her club position. She currently serves as Sustainability Club President, overseeing student-led sustainable efforts. After funds were secured, Mercyhurst’s maintenance staff built the outside of the structure from untreated lumber. The wood is safe for bees and the inside is filled with logs for bees to burrow in, encouraging them to live and rest there. The bee hotel was installed in May and completed in June of this year. It now sits overlooking the sustainable landscaping behind Warde Hall. The foliage surrounding the hotel is also attractive to bees, with local, perennial and edible plants that will benefit from the pollinators. The local plants also help manage the drainage of the hill. The move has been welcomed by many students on campus who are happy to see Mercyhurst do its part to protect Erie’s native species in such a simple and cost effective way. Jordan Kessler, sophomore Intelligence Studies major, believes that this move is a positive step toward bigger projects. The current structure will also indicate over the next few years, what sort of structures and what other efforts Mercyhurst can make in the growing sustainability realm.